The Mack Daddy-O by Zombie Tools | Nerd Much? We’re all about being prepared for the impending zombie apocalypse, and while we’ve already got a large stack of Twinkies in our basement shelter, it’s time to start thinking about how we’re going to defend ourselves against our undead foes. Believe it or not, there is a company that awesomely specializes in crafting high-quality weapons for the zombie apocalypse, properly named Zombie Tools. Zombie Tools is a Montana-based company that is all about making big, badass blades. Their blades are burly, fully functional and highly durable. 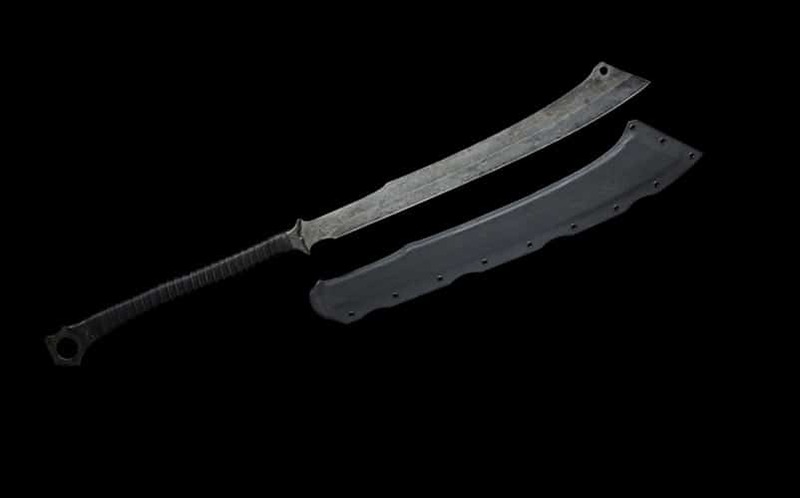 They use a proper mix of technology and traditional blade-forging methods to give each blade an impressive look, all while making it fully functional (and, highly dangerous to zombies). Each of their blades is full-tang, battle-ready, sharpened and sheathed pieces of 5160 and 6150 spring steel that has been heat-treated to yield a 55 Rockwell hardness. Each handle is made from T-6 aluminum, and each blade is given an acid etch with ferric chloride. Each of their blades, like the Mack Daddy-O that has a 24-inch blade, is made-to-order and take between 4 to 8 weeks to ship. They also have smaller blades, like the Scyllis, if you prefer something a little more portable. And although they won’t give you +15 Strength or +10 Endurance, their blades will give you +100 Zombie Slaying.